Mostly referred to as a dessert fruit, Cherries are used in pies, cakes or for garnishing and eaten as they are. It is also a powerhouse of plenty of anti-oxidants and health promoting compounds. Cheeries is one of the most favorite summer fruit of all time, the small, dark red fruit is packed with number of nutritious ingredients. The glycemic index of cherries is 22 which is towards the lower end of the GI scale. It is also a low glycemic load fruit(2.7). Are Cherries safe for Diabetics? Yes, a handful of cherries (approx. 90 grams) gives you about 60- 70 calories which is completely safe for a diabetic population. The anti-oxidant anthocyanin which is responsible for their red color reduces inflammation and thus protect the nerve damage which is usually a consequence of high blood sugar levels. Are Cherries safe for Weight Loss? 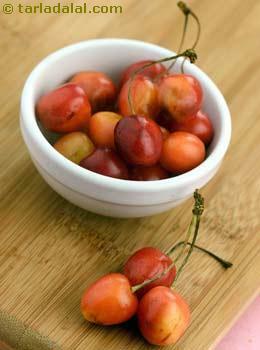 These cherries proves to be immensely beneficial while you are on a weight loss diet because of its low calories. The fiber content of around 1.4 grams in cherries in a handful of cherries helps you manage your weight. It is also loaded with good amount of dietary fiber which ultimately improves your digestion and helps relieves constipation.